In the early 1940’s pianist Walter Gross wrote a tune, known informally as “Walter’s Melody,” that he played for friends and at club dates. One of Gross’ friends, singer Margaret Whiting, introduced the pianist to lyricist Jack Lawrence who, in turn, wrote lyrics for the tune. Gross initially objected to “Tenderly” for the title, arguing that it sounded like direction for a performer, but he eventually came around. 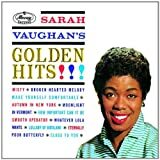 In 1946 Gross took a position as A&R (artists and repertoire) director with Musicraft, an independent record label with which Sarah Vaughan had already signed her first long-term contract. In 1947, at Gross’s request, Vaughan recorded “Tenderly,” accompanied by (husband/manager) George Treadwell and His Orchestra. It was a modest hit which rose to number twenty-seven on the pop charts. In 1950 the Lynn Hope Quartet’s recording of the song rose to number nineteen, but it was Rosemary Clooney’s 1952 recording, accompanied by Percy Faith and His Orchestra, that popularized “Tenderly.” Clooney would later comment that “Technically it’s the most satisfying record I ever made.” Satisfying financially as well, Clooney’s recording climbed to number seventeen and went on to become a million seller. The 1953 Billboard Disc Jockey poll voted “Tenderly” the number six all-time record. In 1961, German Orchestra leader and composer (“Strangers in the Night”) Bert Kaempfert’s recording of “Tenderly” entered the pop charts briefly, climbing to number thirty-one. Despite the song’s subsequent popularity, Vaughan is credited with bringing “Tenderly” into the world of jazz. It was her first solo hit and has been credited as marking her transition from jazz artist to popular singing star. Vaughan would record two more hits with Musicraft in 1948, “Nature Boy” and “It’s Magic,” before moving on to recording with the major labels, including Columbia and Mercury. Jack Lawrence’s lyrics tell the story of love found, while reflecting the tone of Gross’s composition within an atmosphere of warmth and vulnerability. He cleverly created a series of inner rhymes using paired phrases such as “evening breeze caressed the trees,” “trembling trees embraced the breeze,” that drew attention away from the fact that the lines are repeatedly ending with the title, “Tenderly,” a word he hopes the listener will never forget. In 1953 “Tenderly” made a memorable appearance on the soundtrack of the MGM musical, Torch Song. Joan Crawford plays a Broadway star, hell-bent on success, who falls in love with blind piano player (Michael Wilding). A recipient of the Harvard Lampoon Worst Films Award for 1953, the movie, shot in 18 days, is now sought after for its “camp” appeal, especially Crawford’s vicious character and her performance (in blackface) of the Howard Dietz and Arthur Schwartz “Two-Faced Woman,” which Clive Hirschhorn, in his book Hollywood Musicals, says is “one of the worst production numbers ever put on film.” Critic Pauline Kael comments, “The viewer is asked to admire Joan Crawford’s legs and her acting, which consists of pushing her mouth into positions meant to suggest suffering. The first is easy; the second impossible.” Crawford’s vocals, including “Tenderly,” are dubbed by India Adams. This section suggests definitive or otherwise significant recordings that will help jazz students get acquainted with “Tenderly.” These recordings have been selected from the Jazz History and CD Recommendations sections. For digging into this tune, one is virtually obligated to begin by listening to Sarah Vaughan sing it, and her original version of it (1946-1947) is definitive from that standpoint in spite of its somewhat syrupy production. Among more modern interpretations, Bill Evans’ waltz-time version with Sam Jones and “Philly” Joe Jones (Everybody Digs Bill Evans) has impacted a great many musicians since the release of Everybody Digs Bill Evans in the late 1950s. Movement Primarily skips. The main motivic device of “A” is a rising third followed by a fall of a minor second, perhaps recalling the movement of waves near the shore, referred to in the lyric. There are large leaps in the “B” sections of minor and major 7ths ascending and octaves descending. This tune is strongly Impressionistic with faint echoes of Faure and early Debussy. The “A” melody is repetitive over a changing harmonic progression. The “B” melody builds on an initial rising seventh followed by a descending third (in the chords of the moment, this is Cb up to Bb over an Abm7, descending to G over a Bb13). In the second and third repetitions, an intermediate step between the first and second notes of this motif is added, outlining the 3rd, 5th and 9th of the underlying chord. Harmonically, the voice leading is very orthodox–few surprises here. The melody is challenging in that many of the important tones are the “color” tones of the chord–the major 7th, the raised 11th, the 13th, etc. A good aural familiarity with “extended” and altered harmonies will be helpful in learning this piece. “Tenderly” seems to have been written with sensuous saxophonists in mind. But the first jazz recording of it was by Canadian pianist Oscar Peterson in 1950. Two 1951 recordings are interesting because they are by Americans who had left the US for France, where the sessions were made. Trumpeter Bill Coleman, who visited France in the ‘30s and recorded with Django Reinhardt, did a version, and then the first of the saxophonists, the great but under-appreciated Don Byas did his cover. The following year, altoist Johnny Hodges (the master of the sensual saxophone), who had left Duke Ellington to form his own group, laid down his interpretation (and so did his former boss). Not to be left out, tenor sax legend Lester Young had his turn in 1953. The Sopranos (1999, Chet Baker) HBO drama series, Season 1, Episode 3 "Denial, Anger, Acceptance"
Six Feet Under (2001, Soulstice) HBO drama series, Season 1, Episode 2, "The Will"
Dolphy treats us to a landmark solo performance on alto saxophone. His innovative style always made room for melody, and the balance between lyricism and edginess is striking here. This is the first of Vaughan’s many recordings of this tune. It may not be her most “jazzy” rendition, but she sings the melody beautifully, making this an ideal introduction to the song. In a trio with bassist Sam Jones and drummer “Philly” Joe Jones, Evans offers a spirited and creative waltz-time performance. Shank’s edgy alto sax is energizing, and “Tenderly” never sounded less tender. He opens it up tempo and swings into a wonderful improvisation underscored by the stellar rhythm section: Cyrus Chestnut (p), George Mraz (b), Lewis Nash (d). Trumpeter Armstrong is fantastic and Ella is pure magic as the two greatest voices in jazz inspire each other in this flawless reading of “Tenderly.”’ Oscar Peterson at the piano, Herb Ellis on guitar, and bassist Ray Brown take it beyond perfection. Ray Brown introduces “Tenderly”’ on solo bass before the trio with pianist “Finest,”’ as Ray called him, kicks in with Elvin Jones on drums. The Penguin Guide to Jazz on CD raves that “’Tenderly’ has never been more “tender”’ than in the hands of saxophonist Ben Webster. Breathy and romantic, Webster is in top form and surrounded by the ultimate sidemen in Oscar Peterson, Herb Ellis, and Ray Brown. As expected with a lineup like this, there are moments of sheer brilliance during this slow shuffle rendition of the song. Guitarist John Scofield, pianist Fred Hersch, bassist John Patitucci, and drummer Peter Erskine join the vibraphonist. Ellington conducts from the piano, but it is clarinetist Jimmy Hamilton who steals the show with his heartbreaking eloquence.